On September 15, 2013, His Holiness Patriarch Kyril announced the establishment of a feast day dedicated the sacred memory of Holy Right-believing Prince Peter and Princess Febronia of Murom to be held annually on the Sunday before September 19 (therefore, this year on Sunday September 14), since this holy couple has been manifest as a pious example of and intercessors for married life. Last year in Decree No. 14/2013, His Eminence Kyrill Archbishop of San Francisco and Western America gave direction on how this feast day should be marked in the monasteries, parishes and missions of our Diocese. The Divine Service to Holy Righteous Peter and Febronia should be included in the All-night Vigil on Saturday night and the Divine Liturgy on Sunday (where possible). Special petitions are to be included during the Divine Liturgy at the Augmented Litany. And, a brief molebin is to be served at the end of Liturgy including the singing of the Troparion, Kontakion and reading of the prayer to the Saints. The Life of Holy Righteous Peter and Febronia of Murom may be found here. The full Divine Service to the Saints (in Church Slavonic) may be found here. The akathist to the Saints (in Church Slavonic) may be found here. 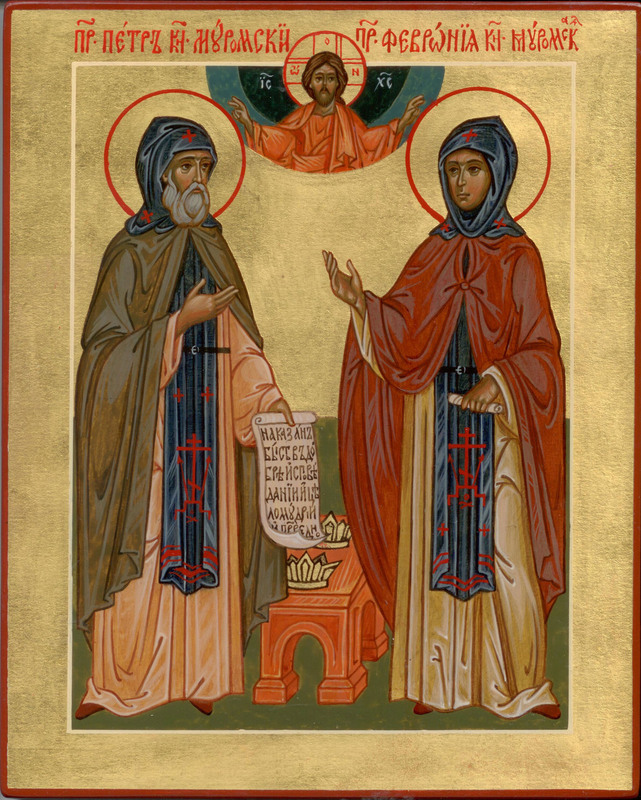 Having lived thy good life in piety, O blessed Peter, thou wast a most precious offspring of the pious root; and thus having pleased God in peace with thy spouse, the all-wise Febronia, the holy monastic life was vouchsafed unto you. Beseech the Lord, that He preserve our homeland unharmed, that we may honor your memory unceasingly. Pondering the transitory glory and governance of this world, O Peter, thou didst live piously in peace with thy spouse the all-wise Febronia. Having pleased God with your alms and prayers. Wherefore, lying inseparably in the tomb even after death, ye invisibly impart healing. Pray now unto Christ, that He preserve our land and the faithful who glorify you. Again we pray that Thy people may keep this Commandment: What God hath joined together, let no man put asunder; and that the churches of their homes may be granted indestructible might and an abundance of love unfeigned. Again we pray for the preservation of the wedded bond of Thy servants in peace and oneness of mind, in piety and purity. Again we pray that Thy people may be gladdened by the sight of sons and daughters, that our nation may increase, and that Thy blessing may be an inheritance therein unto generation and generation. O great favorites of God and all-wondrous wonderworkers, right-believing Prince Peter and Princess Febronia, intercessors for the city of Murom, preservers of honorable marriage and diligent advocates for all of us before the Lord! In the days of your earthly life ye showed forth a model of piety, Christian love and fidelity one to another, and thereby glorified lawful and blessed marriage. Wherefore, we have recourse unto you and pray with mighty zeal: Offer your holy supplications unto the Lord God for us sinners, and ask for us all things of goodly benefit to our souls and bodies: right faith, good hope, unfeigned love, unshakable piety, success in good works; and by your supplications grant even more unto those united by the bond of matrimony chastity, love for one another in the bond of peace, oneness of mind of souls and bodies, an unsullied marriage bed, an undisgraced sojourn, long-lived progeny, the favor of children, homes full of goodness, and the imperishable crown of everlasting glory in eternal life. Yea, O holy wonderworkers, disdain not our prayer which are offered unto you with compunction, but be ye our faithful helpers before the Lord, and vouchsafe that through your intercession we may receive eternal salvation and inherit the Kingdom of Heaven, that we may glorify the ineffable love for mankind of God Who is worshiped in Trinity – the Father, the Son and the Holy Spirit – unto the ages of ages. Amen.